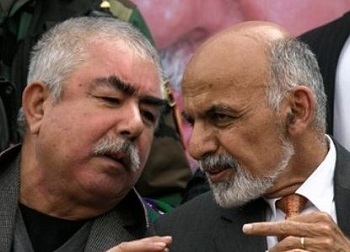 Tolo News: Office of President Ashraf Ghani’s First Vice President General Abdul Rashid Dostum on Thursday said that relations between Dostum and the Presidential Palace (ARG) were improving, but officials gave no details about when Dostum would return to Kabul. Members of the public meanwhile said that Dostum has the right to return to his country – the same as any other Afghan. However, they said government should finalize the case of abduction, assault and sexual assault against Dostum involving former Jawzjan governor Ahmad Eshchi. Click here to read more (external link). I TOLD YOU ALL AND ALL ALONG. devotion is factors in to stooge selections.